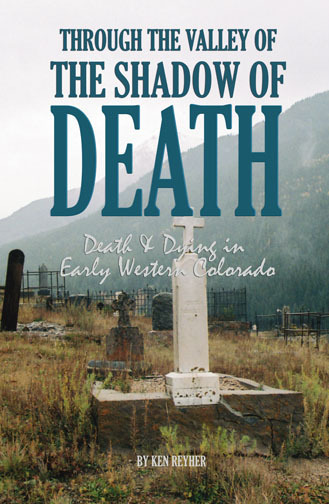 Not only was living in the pioneer days of Colorado hard and difficult work, but death and dying was more painful and onerous too. Because of all the hardships they endured, people died a lot younger; and because of the lack of medicines and doctors, they often died of diseases or hazards that we wouldn’t even think of as deadly today. Often there were multiple deaths – perhaps even of entire families. Yet Reyher tells the stories of this part of pioneer life, not in a macabre and offensive way, but rather as tales of hope, courage, and survival for those who were left behind, as well as for those that knew they were dying. Religion and a fatalistic attitude also helped the women dying in childbirth or their children dying at a young age to do so with peace and comfort. The pioneers’ grit and strong eligious beliefs of all kinds helped survivors to get through their loss and continue on. Sometimes this was literally true, as family members died and were buried along the trail – their graves never to be seen again. At other times it was the event that sparked a new cemetery, so that others might have a place to bury and continue to return to their loved ones. Antoine Roubidoux and Fort Uncompahgre, High Country Cowboys, Silver and Sawdust, and Wilderness Wanderers. Ken is the director at the recreation of the fur-trappers’ Ft. Uncompahgre in Delta, Colorado and often speaks and teaches on pioneer lore.